Today, I welcome debut author Tiffany Schmidt to the blog for a round of Fast Five! Tiffany is the author of the much anticipated SEND ME A SIGN which hits the shelves October 2nd. Let's take a look at her book and then dive into the Fast Five. Mia is always looking for signs. A sign that she should get serious with her on-again, off-again soccer-captain boyfriend. A sign that she’ll get the grades to make it into an Ivy-league school. A sign that the summer before senior year will be the best one yet. But when Mia is diagnosed with leukemia, the only sign she wants to see is that she will survive cancer and still be the girl she’s always been—top student, top cheerleader, and top of the social food chain. Until she’s better, Mia doesn’t want anyone to know she has cancer. She doesn’t want her friends’ pity. And she certainly doesn’t want to start feeling something more than friendship for the one person who knows her secret, her best friend, Gyver. But the sicker Mia gets, the more she realizes that not even the clearest signs offer perfect answers, an in order to discover what will happen in her life, she will have to find the courage to live it. As a cancer survivor myself, I am very drawn to this book. Knowing Tiffany, I believe I'll find a story that rings with humor, pathos, and emotional truth. I can't wait to read it. Tiffany dedicated the book to a former student of hers who passed away this past January from cancer, and is currently running a pre-order promotion. For every pre-order (you must send her proof of purchase ... go here for details), she'll donate one dollar to two separate cancer charities focused on kids. Want to grab your own copy and help? Here are some links! IndieBound, Amazon, Barnes & Noble. Now, let's see what Tiffany had to say for her Fast Five! 5) The yet-to-be-purchased dress for my launch party. I'm not sure what it will look like yet, but let's cross our fingers I find something fabulous. Thank you, Tiffany, for such a fun interview! What do you think of Tiffany's lists? Is she your soul sister or are giving her the Beady Eye over batman and unsweetened butternut squash? As an oncohaematology nurse that theme is one that's gonna be close to the heart, but I'm not sure if I'll be able to read it... I don't want anything that is work related that makes me cry, I have enough bad days at work! And I heart anyone that hearts wellies! Wellies and puddled splashing for the win! I can even forgive the b Batman! Oh how I cringed when I saw that typo! I was clearly distracted by the thought of Christian Bale dancing. Thank you Tiffany, I've added the book to my amazon wish list! Don't get too jelliez, C.J., but I got to read the ARC of SEND ME A SIGN and it's phenomenal! And so is Elf, salted caramel everything, and tiaras, although I admit I've never watched any of those TV shows so I can't ruin Gilmore Girls for you, Tiffany. Also -- you HAVE to go watch Gilmore Girls, Gina! I'm assigning it for homework. ....Amy+Laurie club?! BLASPHEMY! 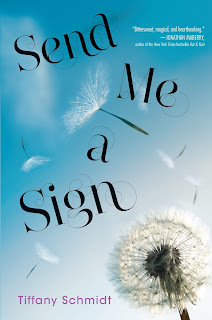 I'm really looking forward to reading Send Me a Sign, though. :) And this post reminded me I should find my wedding "tiara" (which is actually a sparkly, rhinestoney headband since I have a pixie cut) and wear it. All the days. Great post! Hooray! I am a fan of All Things Sparkly, so get that headband-"tiara" out and wear it!